The cyclone had set the house down, very gently – for a cyclone – in the midst of a country of marvellous beauty. There were lovely patches of greensward all about, with stately trees bearing rich and luscious fruits. Banks of gorgeous flowers were on every hand, and birds with rare and brilliant plumage sang and fluttered in the trees and bushes. A little way off was a small brook, rushing and sparkling along between green banks, and murmuring in a voice very grateful to a little girl who had lived so long on the dry, grey prairies. So many classic books have been immortalised on film and subsequently replaced in the minds of the public by their celluloid cousins. The Wonderful World of Oz is one such book. Even the title is different! Perhaps if the Michael Jackson/Diana Ross film had done better, we would all think of it as The Wiz. As it is Judy Garland’s singing Somewhere Over the Rainbow and the thematic quote ‘there’s no place like home’, have captured our imagination, not Baum’s original text. Even the meaning of the film has changed our understanding of the story. The Wizard of Oz ends with Dorothy realizing all her adventures were a dream. The grimmer 1980’s sequel Return to Oz and opens with the young heroine being locked away in an asylum due to her psychotic delusions. Baum makes it clear that the Land of Oz itself is a real place, one that exists outside the ‘civilized world’. Dorothy is swept away when a cyclone snatches her aunt and uncle’s house, transporting it to the bright and colourful country so far from the grey Kansas landscape she grew up in. When she steps outside the house she is greeted by the kind Witch of the North and a strange people known as the Munchkins, who congratulate her on having killed the wicked Witch of the East. Dorothy is shocked at the accusation and insists she did not mean to kill anybody. The Munchkins thank her regardless, as they had been enslaved for many years by the powerful and evil witch and make her a gift of their former tyrant’s silver slippers. When Dorothy asks how she can find her way home again, the good Witch of the North explains that Oz is far away from America, cut off from the rest of the world by vast deserts that are impossible to cross. She recommends that Dorothy travels along the Yellow Brick Road to the Emerald City and ask the great and powerful Wizard who lives there for help. Dorothy and her dog Toto set out immediately, soon coming across three new companions. They rescue a talking Scarecrow from a Munchkin crop field; the Tin Woodsman from being rusted in place in a forest; and meet a cowardly Lion, who longs to be King of the Beasts, but is too afraid. When Dorothy tells the three companions that she is travelling to meet the Wizard living in the Emerald City to ask for his aid, they all offer to join her on her journey. The Scarecrow longs to have a brain, so he can think like other men and not be thought of as a fool. The Tin Woodsman used to be a real man and wishes to have a heart again, so that he can fall in love with the woman he left behind. The Lion is desperate to gain some courage, as he is tired of being frightened all the time. The journey is long and perilous, with the group chased by the beastly Kalidahs and forced to cross a magical poppy field. Finally they arrive at the Emerald City, only to be commanded by the Wizard to kill the Wicked Witch of the West. Only then will he consent to giving Scarecrow a brain, the Tin Woodsman a heart, the Lion courage and Dorothy a way to return home to Kansas. While I was reading this I found myself comparing the text to the film throughout. It was the same years ago when I read Alexandre Dumas’ The Three Musketeers and had the theme tune to Dogtanian and the Muskahounds stuck in my head throughout. 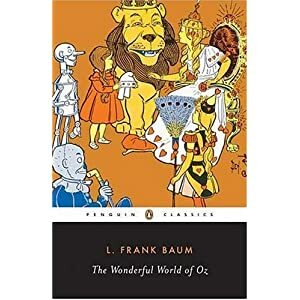 This is a great shame, as Baum’s writing is both simple and beautiful, with Dorothy’s companions symbolic of the hardships suffered during the 1893 Depression (farmer, factory worker and soldier). This is a fable that deserves its long-life. Thank you for reminding me that the iconic movie came out of a great book! Great choice. I hope I didn’t write overmuch about the film, but I thought it was more honest to describe how the MGM picture has managed to replace its source in our memories. I find that very interesting. Plus I kept bugging Steph while I was reading it complaining the flying monkeys hadn’t shown up yet. It’s a shock to read the phrase ‘silver slippers’, instead of ‘ruby slippers’! I owe my childhood vocabulary to this series! There are 14 Oz books (I can almost remember each one) and they get increasingly dark and intriguing. I would love to track them down. I was reading a few years ago about the hundreds of Oz tributes, homages, fan-fic what have you that’s out there. It has been going on for decades, communities of fans who corresponded via mail, or fanzines. I would be fascinated to track down some of these unofficial ‘sequels’. I would read the 14 that Baum wrote first! « And the names of the Winners are….